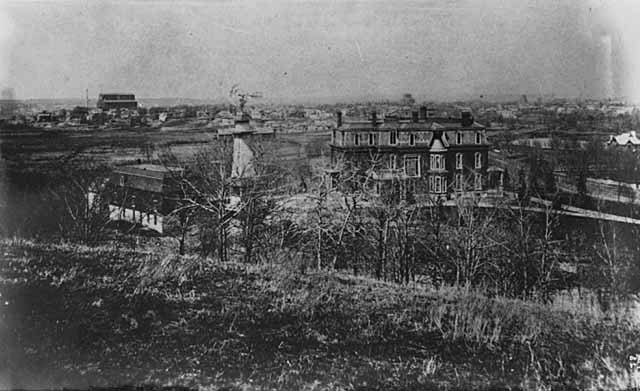 Lowry Hill became the most fashionable address for wealthy Minneapolitans at the end of the 19th century. Before white settlement, Lowry Hill was partly open prairie -- but it also included a rugged hill that the Indians called the “Devil’s Backbone.” In 1867, Calvin Goodrich, a doctor from Ohio, bought the 148-acre parcel. A year later, he, his wife Mary, their daughters Beatrice and Nellie, and their sons Calvin Jr. and Charles, moved to Minneapolis. Arriving about the same time in Minneapolis was Thomas Lowry, a young man who had just passed the bar exam in his native Illinois and who may have been influenced by his family’s lawyer, Abraham Lincoln. Lowry rented office space on Washington Ave. in downtown Minneapolis and hung up his shingle to practice law. After a year or so, he met Beatrice Goodrich. They were soon engaged and were married in 1870. He was 27; she was 16. Lowry’s financial situation improved in the next few years and he and Beatrice became co-owners of those 148 acres plus another 70 acres to the north. The land was mostly wild with a few cabins scattered here and there. In 1872, the Goodriches and the Lowrys had their suburban 218 acres platted as the Groveland Addition. The first house to go up, in 1874, was the Lowry’s own two-and-one-half-story house. The lot, containing the house, a large barn, a windmill, and out buildings, covered an entire block on the brow of the hill facing Hennepin Avenue where the Walker Art Center now stands. By the late 1870s, Lowry became interested in a new commercial enterprise -- a street railway system for the rapidly growing city. 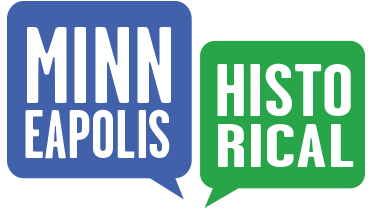 He eventually became president of the Minneapolis Rapid Transit Company and then bought the street railway system in St. Paul. Lowry learned that people would buy lots and build homes if the lots were close to the horse-drawn (and later, electric) streetcar lines. He bought large, remote land parcels, subdivided them, and extended his railway network to reach those areas. Calvin Goodrich died in 1880, and his children and their spouses inherited a greater interest in the Groveland Addition. In 1886, Lowry hired a contractor to chop the top off the hill and deliver 300,000 cubic feet of fill to the low, marshy area where today’s Walker Sculpture Garden now sits. With sales still minimal, Lowry next decided he needed some exemplary houses in the area. He hired his friend and neighbor, architect Frank Long, who had built his own house at 41 Groveland Terr. Long’s architectural firm, Long & Kees, had designed some of the most prestigious buildings in the city, including the Masonic Temple, now the Hennepin Center for the Arts. Permits were drawn to build 15, 21 and 25 Groveland Terr. With homeowners including W. S. Nott, William Donaldson, and Long himself taking the plunge to live in the “country,” others started buying lots, and Lowry Hill was on its way. Written by Bob Glancy -- edited by Richard L. Kronick, “Lowry Hill Introduction,” Minneapolis Historical, accessed April 18, 2019, http://minneapolishistorical.org/items/show/123.